Writer/director Sean Baker spoke at Rollins College yesterday and asked the question, “Can cinema change the world?” He talked about the filmmakers and their films that have inspired him over the years. As with his own films (The Florida Project, Tangerine), Baker is drawn to films that are “passports to the underrepresented,” and ones that shine a light on a specific subject or problem, and have potential to have a positive impact on society. Those films—as well as An Inconvenient Truth, JFK, and The Best Exotic Marigold Hotel— give you some insights on why he would be interested in doing a film about the hidden homeless or about an illegal Chinese immigrant. Starting with an issue or a theme can be a dubious beginning as it can be seen as didactic and stepping into the murky waters of propaganda. Baker acknowledged that he doesn’t have all the answers, but he is committed to asking the hard questions. He’s working toward change knowing that change takes time. Sometimes years or even a generation. As a side note, Rod Serling began with a theme on The Twilight Zone episodes yet eventually found a universal audience with timeless truths. Read Serling’s 1968 Moorpark College speech and you’ll see where he stood ideologically. But in the early ’60s he couldn’t overtly write about racism and other social concerns, so he used metaphors. He could address xenophobia by writing about space aliens, as he did on The Monsters Are Due on Maple Street. I wrote many positive posts on this blog about The Florida Project, but one thing it wasn’t was a film that gave us hope for an emotional triumph. I think that is why it had a limited audience. Audiences like to see a character change for the better, even if it’s just one tiny step forward. Halley (Bria Vinaite’s character) took (at least) two giant steps backward and devolved (taking her daughter with her) making it difficult for some to even finish watching the film. Baker’s a bold filmmaker. It takes him three years to make a film so he made the film he wanted to make. And maybe the change—the emotional triumph— that he wanted to see was not one that happened on the screen, but one that happened to those that watched the film. Personally, no film resonated and haunted me more in 2017 than The Florida Project. As Baker pointed out, change can be on a micro level. One life changed because The Florida Project co-writer Chris Bergoch learned via news outlets about the hidden homeless living in hotels in the shadow of Disney World. P.S. I know one of the conventions of indie filmmakers is unconventionality. Offbeat (even unlikeable) main characters, mini or non-plot stories, and downbeat endings. But if you want to nudge the world a little—to borrow Tom Stoppard’s phrase once again—please revisit On the Waterfront. It’s Hollywood filmmaking at its finest. (Marlon Brando, Elia Kazan, Budd Schulberg, Eva Marie Saint, Leonard Berstein) And it’s based on articles by Malcolm Johnson (see the book On the Waterfront) based on corruption that was common on the New York Harbor. It’s a film that’s very specific to New York City/Hoboken, New Jersey in the ’40s & ’50s, and yet a timeless story that’s played out in one form or another throughout the world, throughout history. Considered a great American film—by some—and an anti-American film by others. Nothing like a controversy to keep the conversation going. It’s number eight on AFI’s 100 Films…100 Years list, and one of my favorites that I return to again and again. On the Waterfront won eight Acadamy Awards, including Best Picture and Best Writing, Story and Screenplay. Here’s the screenplay. The film is available on Blu-ray as part of The Criterion Collection. On the other hand, when Charles Dickens wanted to address child labor laws and other poor social conditions in London, he didn’t write a pamphlet encouraging reforms—he wrote Oliver Twist, Hard Times, and A Christmas Carol. Musician Bruce Springsteen walks that line of entertaining large crowds, yet at the same time writing and recording songs with a social consciousness. Youngstown is one of my favorite Springsteen songs because it connects me to a grandfather I never met who spent over 30 years working at Youngstown Sheet and Tube steel mill. I’ll write more about Springsteen and his Broadway special later, but one of the reasons his songs are both gritty and hopeful is he mixes blues with gospel music over and over again in his songs. This is part two (of what I think will be four parts) of an interview with screenwriter Rick Ramage (Stigmata). In part one we covered how he was born in Fargo, North Dakota, raised in Denver, Colorado, where in his mid-twenties he was selling tractors when he wrote his first screenplay. That led him to getting accepted at the American Film Institute in L.A. where he got a formal education writing and making short films. Scott W. Smith: I read that when you were at AFI you had the opportunity to work with and up an coming young actor named Tobey Maguire. Rick Ramage: Yeah, that was an unbelievable day. He wasn’t a star then; I think he was 12 or 13 years old. He walked in an just nailed that audition. Tobey and I became fast friends. We’ve lost touch now, but we hung out for quite a while after that. He was just a wonderful kid. Bright and cocky, he had all the right stuff. He was a wonderful actor. He just had it. I always tell that story when I’m at a party, “Oh, I know Spiderman. He was in one of my movies.” “Really, which one?”, “Ah…it was a student film.” But it’s still fun. SWS: What did you do after your formal film education at AFI? RR: After film school I worked at Omega Cinema Props for almost a year while I continued to write, and I got lucky and I optioned a script. I actually optioned my script right before I got out of film school. SWS I think I read where that first script optioned for $5,000. RR: Yep, Five thousand bucks, but it felt like a million though. It never got made. But I had a serious sale after that and was busy. I started to work on the project Shakespeare’s Sister which turned into The Proposition  which was the first movie that I had written get made. Ted Field and Diane Nabatoff who were at Interscope bought that script. I never looked back after that. SWS: So you had success right out of the gate. RR: This is the truth— but I almost hesitate to tell it because I had such a dream experience—I sold Shakespeare’s Sister and literally in the next week or ten days the first director I ever met was Steven Spielberg and the second director I ever met was Sydney Pollack. Both on the same day and both gave me a job so I was thrust into a level for which I was in no way prepared. Those guys are massive storytellers and massive directors, but they read Shakespeare’s Sister and were intrigued enough to give me a shot. So here I went from having $17 to having Shakespeare’s Sister sell. As you know, you get half up front and half upon production, so I had a couple hundred thousand there. So I went to work with both of those directors. It was phenomenal. I thought “great, this is how it works”. Everybody wants that to happen. And I stayed in the studio system for the next 15 years. I would do re-writes. I’d sell a spec—I’ve sold 10 or 11 spec scripts. I was pretty spoiled. SWS: Stigmata, of which you are co-credited as writer with Tom Lazarus, is one of your highest profile projects. How did you get on that project? RR: I was asked to do a rewrite on Stigmata by Frank Mancuso and it was shortly after The Proposition was made. I didn’t even know what stigmata was. I got a call from MGM and they asked if I’d look at it. I love projects where I don’t necessarily know the answer that I’m looking for. I have a theory that if I can get you to identify in the first few pages and ask, “What would I do here?”, I got ya. SWS. I thought the scene in Stigmata where Patricia Arquette gets a stigmata raised a major dramatic question and it made me think “What’s going to happen to her?” and carried that through to the climax when that was resolved. RR: I tend to look for God a lot through character and scripts. I love that because there is no answer, right? It’s what you arrive at dramatically that counts. As long as you approach anything with reverence, I think people will respect it. I had a director ask me once, “What’s the one thing you come out of the movie theater with?” and I’m like, “Duh, I don’t know.” He goes, “An opinion. It’s the one thing that everybody has when they leave a movie.” And he said, “The gift is they’re discussing your movie or engaging about it on the way home.” Because you’ve accomplished something. It’s not Spam in a can. You got people talking about it. I thought that was great advice. SWS: Stigmata and Se7en were thrillers with religious overtones—both made in the 90s—do you think those films get made today given that the middle class of filmmaking has all but disappeared? RR: I’m glad you put it that way, middle class. Where did the middle class go? I don’t know. It disappeared shortly after the Writers Guild strike. I think a story like Stigmata would definitely more so than a story like The Proposition. As a a society we’ve moved so far past what might have been considered salacious back in the 30s to now is commonplace. Stigmata would. It touches on the spiritual aspect. The horrific elements of Stigmata came out of a real place. The Father named Padre Pio would be attacked in his cell, another word for his room in Italy every month or two (something) would go in there and throw him around. That’s when it got interesting to me, because it’s the yin and yang, good and evil at work. Right after the movie came out—and it was number one that week—I did a radio interview out of New York and the guy said, “I really liked your movie and we’re about to go on the air.” And I said “Good”, because at least he liked the movie. And he came back after the commercial break and said, “we’re with Rick Ramage screenwriter of the number one movie Stigmata, Rick what do you have against Catholics?” I felt my stomach sink into my knees. I said “I don’t have anything against Catholics; I’m married to one. Why?” He said, “Well, you know, in The Proposition the priest sleeps with the woman, and in Stigmata your priest is a bad guy.” I go, “Well, my priest in The Proposition finds God because there is an old saying that ‘Priests are in search of God, and sinner know him.’ And for Stigmata the priest is a bad guy, but so is the good guy. It’s called a power struggle. Certainly the church is a wonderful place for a power struggle.” He said, “That makes sense”, but you get the point, you never know how something is going to be interpreted. I was in awe of what Patrica Arquette did with the role. One of the gifts of a screenwriter is you write it down and then you watch somebody do it better than you ever hear it in your head. That’s a gift. She made it better, and that’s one of the fun parts of getting something made. When I watched her performance, she didn’t blink she went for it. Gabriel Byrne went to seminary so he’d know how a priest would think and act. So it was a great experience. In Part 3 we’ll look at how Rick transitioned to television and other projects. Screenwriter Rick Ramage (Stigmata) has had a career which includes some interesting peaks; he had his first script optioned while he was still a student at AFI, developed projects with Steven Spielberg and Sydney Pollack, had a number one hit movie the week it opened, has sold many spec scripts—and been based in Denver, Colorado for most of his career. Now he’s launching The Screenplay Show to pass on what he’s learned over the years to new and/or unproduced writers. Here’s a Q&A I did with Ramage just two weeks ago that I hope you find helpful in your own journey. Scott W. Smith: I read you were born in Fargo, North Dakota, what road did you take to get to Hollywood, California? Rick Ramage: I moved to Denver when I was in fifth grade and my parents split up almost right away. My mom married a guy who owned a tractor dealership. I worked for him my entire adolescents through high school and I went to university for a year, but I was making way too much selling tractors and college didn’t interest me. I thought, “What’s the point? I’m going to go into the family business anyway.” I thought that was going to be my life. But when I quit school I wanted to be read and well-spoken so what I did is promise myself that I’d read 100 of the classic books. I was about 15 novels into that promise when I realized I wasn’t just reading stories but I was following the ways different writers were presenting their tales and working the elements. SWS: Did you buy the leather bound The 100 Greatest Books Ever Written you used to see advertised in magazines? RR:No, I was haunting this place called the Tattered Cover. I was a bookstore stalker. I would just roam up and down the aisles and if I recognized it as a classic, I’d shift my weight in front of it, and then I’d buy three or four books I found. I didn’t expect anything except to get an informal education. All my friends pretty much went away to college. By the time they got back I was already daydreaming about being a writer. SWS: My wife is from Denver so I’m familiar with a the Tattered Cover Book Store that once had many more locations in the pre-Internet days than they do now. Which one did you frequent? RR: The Tattered Cover in Cherry Creek was the one I was going to. It was a department store for books, a really fun place. They had a great atmosphere. And they had a great attitude about book lovers. I would hang out there for hours. SWS: That was a cool vibe. RR: Totally. I would stop by on my lunches, or on the way home. It was a staple for me. It really gave me—and this will sound corny— a longing to be a part of that world. After daydreaming about being a writer I decided, “I’m going to write a book.” And I thought for sure it was going to be the great American classic. And for the next seven or eight months I worked on it at night when I got home. It was more of a novella, and I sent it to someone I trusted. And the story kind of ends with him saying it wasn’t a very good novel and I was crushed. I felt like I’d been hit with a gut punch. But he was kind enough to say, “But you’re a really good writer. You’re really visual, you should consider writing screenplays.” I had never seen a screenplay presented; I’d never read one. So I went to the Tattered Cover and bought Brian’s Song. SWS: The first movie I ever cried watching. In fact, I think for a lot of men that’s the first movie they ever cried watching. RR: I know! Let’s not talk about it or I might start crying again. But the formatting appealed to me. And so I turned my bad book into a bad screenplay, but I was hooked. I could see a definite structure into how screenplays were written. It appealed to me. SWS. What did you learn from those novels you were reading? And how did it inform your screenwriting? RR:. I think the thing I began to identify quickly when I picked up a novel was a distinctive voice. An author with a very distinct delivery and style would really pull me in quickly. That really stuck with me and I worked very hard at developing the correct voice for one of stories. By that I mean the tonal quality of it. Great writers have this tonal quality to their writing that’s very distinctive. You can tell Dickens from Flaubert. I think that was very conscious with me. I’ll never forget The Scarlet Letter was one of my favorite books because I think it has one of the greatest antagonists ever written. Because Chillingworth didn’t just want to kill Dimmesdale, that was too easy, he wanted to ruin his soul. And I thought, “That’s a bad guy,” you know? Later when I told my agent I wanted to be known as a guy who could adapt books, I think it helped get me a lot of jobs. They knew I wasn’t going down to Blockbuster to get my next idea. SWS: When you were reading all those great novels and started writing your first screenplay you would have been in your mid-twenties, were you still working in the tractor business all that time? RR: You bet. Full time. SWS: Well, since my blog is called Screenwriting from Iowa, I have to ask—what kind of tractors did you sell? RR: I love it. We sold Allis-Chalmers, Owatonna, and Kubota. I was in Denver and my territory was the Front Range. I was selling to a lot of industrial places, rail yards and construction companies. My specialty was Kubotas, and forklifts and backhoes and stuff like that. SWS:. Screenwriter Dale Launer (Dirty Rotten Scoundrels) told me he sold stereos in LA before he sold a screenplay, and I’ve pointed out before the great job former insurance salesman, Pete Jones, did on selling his screenplay on the first Project Greenlight. Do you think being a salesman helped you to become a screenwriter? RR: It did teach me to sell. How to conduct myself in a room when there is a buyer in front of you. I never lost sight of that. I never went in and reduced myself to just explaining to a producer what my dream was. I knew I was in there to sell a product called a script. SWS. Sales is a transferable skill. RR: I really think so. I wasn’t Rico Sauvé. My very first pitch I pretty much got thrown out of Hutch Parker‘s office because I forgot the title of the script. I’m not kidding. I went in there with two producers. They said, “You sure you don’t want to pitch it to us?” I’m like, “No, I’m fine, I’ll be good.” I walked into Hutch’s office at Orion at the time. He said, “Hi Rick, how are you?” You could tell he was busy. We sat down and he said “Go.” And it was like someone fired a gun at my temple. There was no preamble. This was no foreplay. He was very cordial, but “go.” And the producers where like “The Masterpiece.” They actually reminded me of the title and I just looked at them and I started to laugh, and I said I’m sorry I’m not going to be able to do this. And Hutch clapped his hands and said thanks for coming in and out the door I went. And I didn’t pitch again for like three years. It rattled my cage. SWS: Let’s back up a few steps. There must have been a step between being a tractor salesman in Denver and pitching a project to a Hollywood executive. RR: I decided, “If I’m really going to do this, I’m going to go to film school.” I didn’t have a degree and here I was applying to AFI, which is a master program. All of my friends who had degrees at this time said I was chasing rainbows—“Don’t waste your registration fee.” I wrote David Shaw at the AFI a letter and said if it’s about a pedigree I get it, I don’t have a degree. But if it’s about the writing, here’s a sample of my work. And I sent him 5-6 pages of a script I was working on. And sure enough I got a letter that I’d been accepted. And I thought, “there you go, I’m going to be a screenwriter.” So I sold my house, I had a little boy at the time, and talked my wife into going out there. We had two cars and I sold one of those. I needed loans and stuff, but we bit the bullet and moved to L.A. Couldn’t afford to live in Hollywood where AFI was located so we lived way out in Rancho Cucamonga. It was about two, two and a half hours a day one-way. We could get a two-bedroom apartment out there for a reasonable price. This ends Part 1 of my Q&A with Ramage. But just like in a good screenplay the goals, obstacles, and stakes are clear. He desires to be a screenwriter, but he (A) Didn’t go to college, (B) Didn’t start writing until he was in his mid-twenties, (C) Was told his first writing effort wasn’t a very good novella, (D) Lives and works in Colorado, (E) Decides to uproot his wife and child and go to film school in California, and (F) Ends up renting a place that means he will have a significant commute to school. Part 2 of this interview will continue Ramage’s own personal Hero’s Journey and discover how he found success in a competitive field. What’s it Like Being a Struggling Writer in L.A.? That quote actually gives you a little glimpse into the roots of this blog. This is not a recent quote from the now 86-year-old Pierson lamenting how we’re lost in 2012 without any direction home. I actually don’t know how old that quote is—but it’s at least 20-years old. Earlier this week I pulled a notebook of mine off a shelf that’s about an inch thick of screenwriting notes and old articles. I flipped through the notebook looking for a little inspiration and came across an article from American Film Magazine. So while I don’t know the specific month or year of the article, I do know that American Film, a publication of AFI, ceased printing in 1992—so it’s at least two decades old. 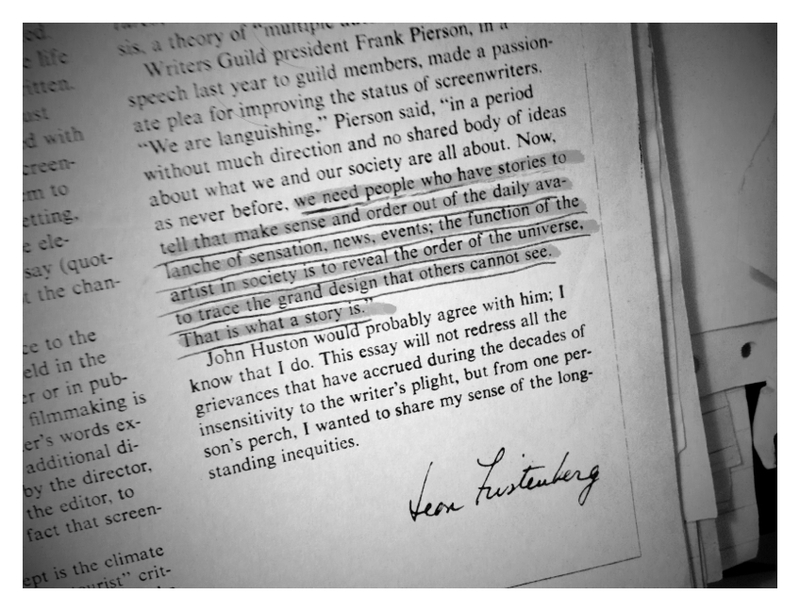 The article is titled The Screenwriter: An Essential Element and was written by Jean Firsteneberg, who headed the American Film Institute in 1980—2007, and is now AFI’s President Emerita. What does in think now that we’re bombarded with You Tube videos, Twitter feeds, 24-hour cable TV, Facebook updates, streaming Netflix and video on demand, email, cell phones with Internet access, and the Real Housewives of Wherever? * The Harvard educated Pierson was also the Writers Guild president from 1993-95, but that was after the American Film magazine had already ceased publication. P.S. Notice in right corner of my little iPhone photo the distinctive round sign of paper printed on a dot matrix printer. All waiting for the era of blogging so these words could have a new life.